The costume for "Soon Fades The Last Memory of Snow" was one of the most time consuming ones I've yet made. 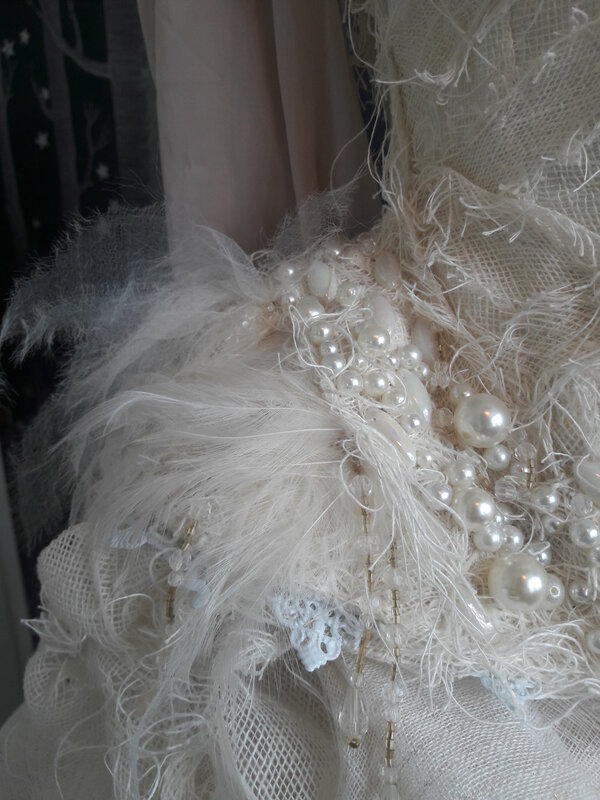 It wasn't so much the actual sewing, but all the little details and huge amount of pearls and beads I wanted to add to it. I'd made the base of the costume earlier but it was just one of those simple things created out of boredom: a very basic skirt and corset combo without anything particularly interesting except the unusual texture made with strips of coarse white linen. This concept and outfit was my take on the classic ice queen character, but from a more vulnerable perspective. She's not just an omnipotent, overly strong and powerful creature with, stark white, blue and ab-crystals. 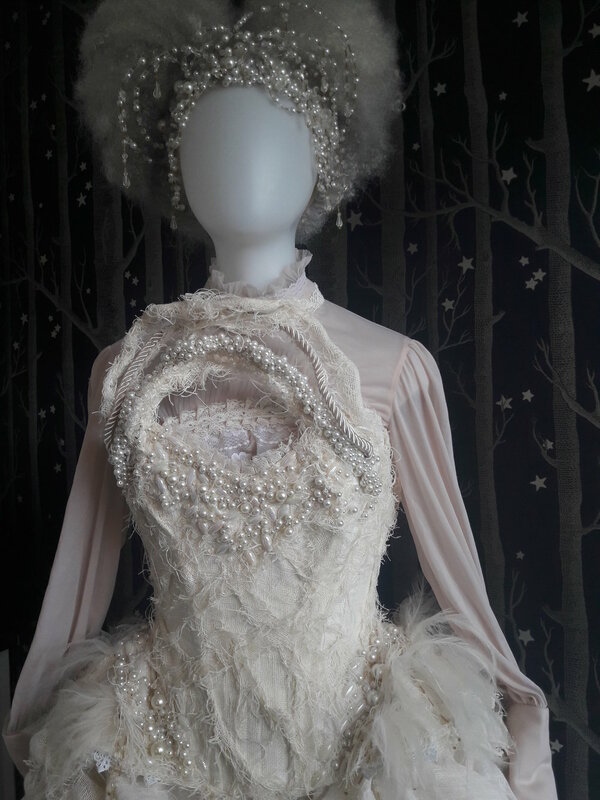 I used different toned white fabrics, ivory pearls and a hint of gold here and there. 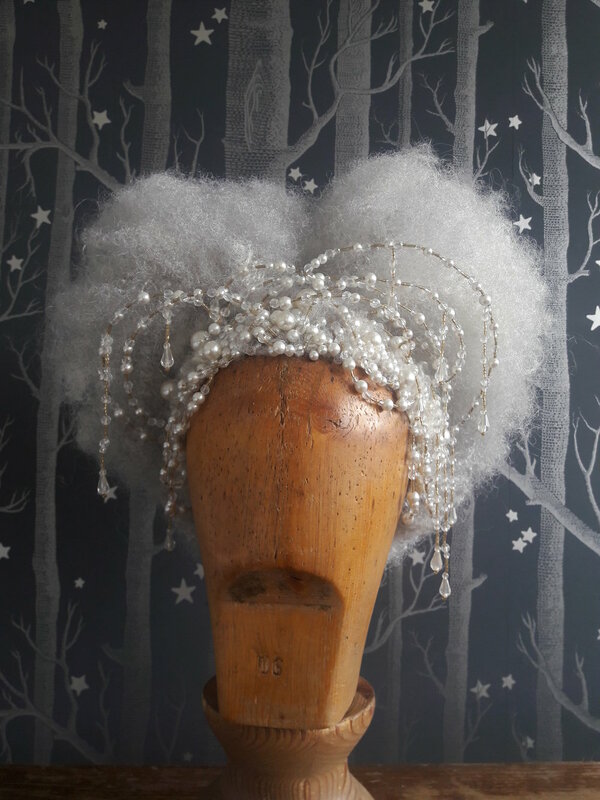 Instead of shiny, festive fabrics I opted for more rustic matte look, combining classic pearls and beads with linen and the soft frizz of the wig. 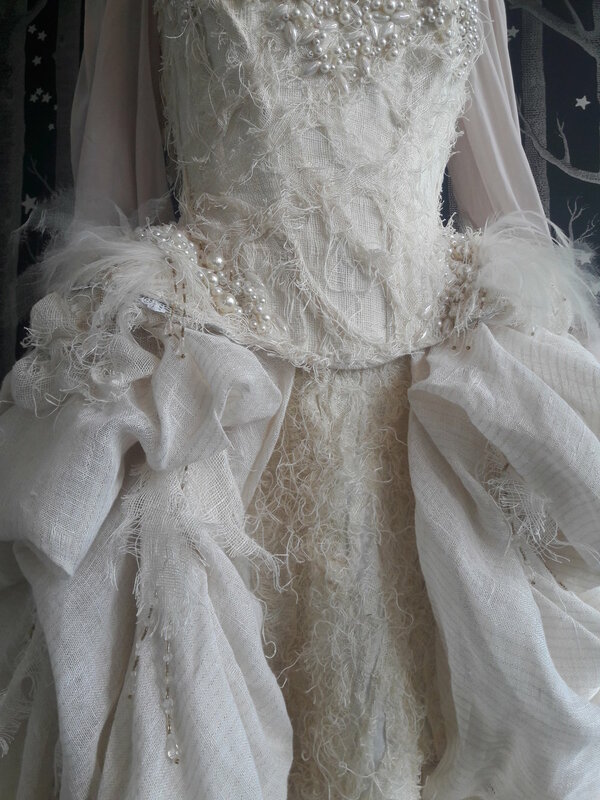 To add to the mix there's also some feathers, shredded chiffon, plastic beetle wings and metal filigree thrown in there. More is more is more. The standing collar was a first for me and I just kind of figured it out while I was making it. It ended being quite heavy and I'm lucky I made the base construction so sturdy to begin with. Without the extra support the whole thing would have looked droopy and sad. You never know when you might want to use super heavy beaded fringe, right? I'm still so very pleased I had that fringe, it reminds me of water and melting ice and ties well with the theme. While the collar was a new experience so was the wig. I handmade it using a mesh wig base and some synthetic hair I blended and curled to achieve that extra fine frizzy curl. I'd bought a huge lot of glass pearls a few years ago thinking myself I'd never be able to use them all. In the middle of beading the hairline of the wig it finally happened, I ran out of my impressive pearl stash. I guess I now have the excuse to buy some more... Experimenting more with wig making is also something I'm going to do again in the future, I really enjoyed the challenge. I'm not a hairdresser of any sorts but playing around with wigs is so much fun, plus it's not putting anyone's well being at risk. I made that frizzy curl wrapping synthetic hair around bamboo skewers and sealing them with boiling water. I guess that's not something to do with real people and their scalps. Me and Mikaela got this "Well, how hard can it be?" -attitude when experimenting and creating new things and that attitude made also this costume possible. I'm not super into drawing and designing, my style is to collect a pile of materials and let them show me what they want to turn into while cutting and sewing. That also requires a lot of faith from the photographer because I can't show any sketches before the pieces are done; I simply don't have any! That big pile of materials for this costume contained for example 3 set of old curtains, welding wire, cotton pads, duct tape, three types of glue, old earrings and vintage slips. Something from nothing is the way to go.